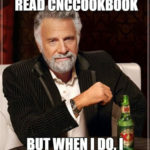 This article is part of our Feeds and Speeds Cookbook. Click here for the full article. I’m not sure when it got to be such a hot item, but rigid tapping seems like one of those things that comes up early in discussions of machines, controllers, and so forth. “Does it do rigid tapping?” is either asked or answered pretty early in the discussion. Some controls provide rigid tapping as an extra cost feature (although it is standard these days for most controls), implying it has considerable intrinsic value when you see what the option costs. I was reminded again of how excited people get about rigid tapping in some recent back and forth over on CNCZone about the advantages of EMC2 versus Mach3, where EMC2 can do rigid tapping, ta da! I’ve been clipping various articles with tidbits about the topic because I knew I wanted to drill down on the subject of rigid tapping at some point. This post is my first shot at it. What are the ways and terminology of CNC Tapping? Let’s start with some basics. Tapping requires a coordinated motion in 3 axes: X, Y, and Z. In addition, one of the axes, the one perpendicular to the threads, has to be pretty precisely synchronized to the spindle that’s driving the tap. That tap wants to move down into the hole at a rate determined by how fast it is rotating versus the thread pitch. If the tap moves down into the hole too slowly, the pull on the threads gets greater and greater as the tap falls behind the place the threads dictate it should be. If it goes down the hole too quickly, it starts to “push” the threads faster than they want to go. Either way, if the discrepancy in where the tap should be versus where it is becomes too great, the threads will tear or the tap will break. Those are both bad outcomes! Broken taps are a pain! There are a number of ways to regulate the speed the tap goes down the hole versus the rate the spindle is turning. 1. The simplest level would be on a machine that has a quill. You can “power tap” by putting just enough pressure on the quill that the tap can basically pull itself down the hole at the rate it wants to travel. This is a very manual operation that Bridgeport operators are familiar with, so it is not very suitable to CNC. Except for the oldest machines and retrofits, you won’t have a quill anyway. 2. Use a tapping head. The tapping head allows some leeway for the tap to move up or down in the hole so that again, the threading process itself drives the exact speed it is going down the hole. 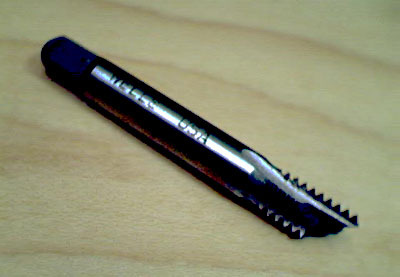 The other advantage of a tapping head is it has a gearbox. That gearbox adds torque at low tapping speeds and also will auto-reverse the tap when it comes time to withdraw it without requiring the spindle to reverse. This raises another issue for would be tappers: spindle control is paramount. If you are tapping a blind hole you’d better be able to stop the spindle’s rotation and reverse it very quickly lest you drive the tap into the bottom of the hole and break it. This speaks to VFD considerations like making sure you have a breaking resistor. There are some issues with a tapping head. They’re not compatible with an automatic tool changer. Related is that they require some setup. They have a stop bar, for example. They’re bulky and use up a lot of Z travel. As the video mentions, you’ll need to adjust torque as well so the slip clutch will slip without breaking the tap. There are some advantages for a reversing head, even for rigid tapping, which we’ll talk about, but in general, the old-style bulky tapping heads like the one in the video are not used much with CNC. As described in the video, the tension/compression feature relies on springs and has about 1/4″ of travel to compensate for errors in either the push or pull direction. Typically, you’d program the g-code to run the tap into the hole slightly more slowly than the thread would suggest and rely on the tension feature to keep that under control. This compensates for minor fluctuations in the spindle speed. Typically, you’d program to run at 98% of the theoretical speed. You can imagine what happens if a spring breaks and the holder loses its ability to travel because with no spring it might hit the stop immediately. Not having to worry about that issue is one reason to prefer rigid tapping. 4. Rigid Tapping. With this approach, the tapping holder is rigid, meaning it has no tension/compression play. That means the motion of the spindle and the axis moving down the hole have to be precisely synchronized. Delivering this synchronization is one reason rigid tapping requires a more sophisticated controller. Because these motions are precisely synchronized (at least in theory), the tap holder can be rigid (hence the name). There are a couple of ways controllers approach rigid tapping. The most common method, used on a majority of controllers, is to let the spindle go, monitor its actual speed with some sort of encoder, and then vary the feedrate of the synchronized axis to mirror the right ratio of spindle rpm to feedrate for the thread being cut. Lately, the smaller machines, especially the “tapping and drilling” centers, use a type of rigid tapping often called “synchronous tapping.” In this method, both the spindle and the axis speeds are dynamically controlled as servos to get the best synchronized result. This is only possible on machines whose spindles have low enough mass and intertia that their rotation can be dynamically modified quickly enough, hence the use on relatively smaller machines. Synchronous tapping can be done even faster than ordinary rigid tapping because there will be no overshoot of the spindle. With a heavier spindle there will always be a little overshoot. Smarter controls try to slow the spindle down as the bottom of the hole approaches, but that’s a bandaid relative to true synchronization. In addition, true synchronous tapping will experience less acceleration/deceleration related wear in the reversal at the bottom of the hole, so tap life can be better. What are the advantages of rigid tapping? – Rigid tapping is often faster, though this is not always the case–see below. 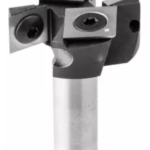 – Tooling cost is lower: high quality rigid holders cost less than high quality tension compression holders. – Rigid tap holders are more compact and reliable than tension compression holders. This may make their use more practical with large workpieces that are near the envelope limits of the machine. – It’s very hard to make a tension compression tap holder with full pressure through coolant, whereas it is relatively straightforward to have high pressure through coolant on a rigid tap holder. – While it is possible to do what is called a “hard start” on a tension compression setup, rigid tapping is better suited for peck tapping when you want the tap to pull completely clear of the hole and then thread down to start again. This requires an even higher degree of synchronization to pull off, however. You’ll need to make sure your machine even supports this mode, and it may be turned off by default, so you need to set a parameter to turn it on. – Removing the spring pressure of a tension/compression holder can result in a more accurate thread, especially for soft materials that are deformable. – It seems that a little bit of tension/compression is helpful even for rigid tapping. This MMSOnline article suggests tap life will increase because the forces on retraction are drastically reduced with just a little bit of tension/compression play. The data on this from the manufacturer of one such rigid holder is impressive. Holders for rigid tapping machines typically only need to provide tension leeway–no compression is required. That little bit of tension play cushions the tap from abrupt spindle motions. Some report that the lack of this cushioning can reduce tap life by up to 40%. – It’s very hard to make the spindle track on speed and reverse quickly enough when doing very high speed tapping (say, 6000 rpm) using small taps. For that reason, there are modern reversing heads that help. You can tap faster with these heads and especially with a little tension/compression built in than you can with pure rigid tapping. Such heads are immune to the acceleration/deceleration and reversing limits of the compartively massive spindle. – It’s worth trying tension compression holders to see if they improve your performance, even if your machine has rigid tapping. For many machines, the performance levels required to fully synchronize are not quite all there. – On some controllers, rigid tapping can limit the possibility of Constant Cutting Speed. Well, what else is new? There’s a whole bunch of claimed advantages for rigid tapping, and under ideal conditions, it’s all true. But of course real life is never ideal. So, even though we shouldn’t need a non-rigid tap holder if the machine has rigid tapping, there can still be advantages in some cases to using one. Even though we shouldn’t need a reversing head, there are still advantages in some cases to using one. Guess what: no silver bullets as usual. But, what is clear is that if your machine is capable of rigid tapping, it can tap faster and put less stress on the tap than a machine that doesn’t have rigid tapping. Hopefully this article gives you some solid grounding in the variables involved in tapping holders and rigid versus conventional tapping. Want the Best Way Ever to Minimize Tap Breakage? It turns out not to be whether you use rigid tapping or any of that. Yes, tapping fluid helps. You also need to be sure to choose the Correct Type of Tap for your needs. But the absolute best way to minimize tap breakage is to reduce the torque needed to tap the hole. And the best way to do that is through choosing a better drill size than the average drill chart recommends. 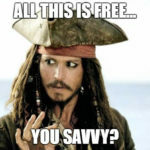 Yup, there are some sneaky trade offs you can make that will save you taps and money. 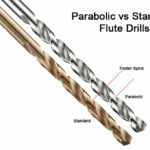 To learn more, check out our article on Drill and Tap Charts with Our Special Drill Tap Size Calculator based on thread percentages. You won’t be sorry!